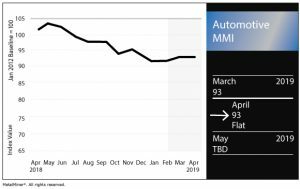 The Automotive Monthly Metals Index (MMI) held flat this month, again coming in for an MMI value of 93. In addition, the company posted its highest first quarter average transaction price in its history. First-quarter sales, however, were down 7% compared with the first quarter of 2018. Ford Motor Co., meanwhile, which also recently announced a switch to quarterly sales reporting, will unveil its Q1 2019 sales Thursday morning. Fiat Chrysler, meanwhile, saw sales dip 7% year over year in March (last month, the automaker posted a year-over-year sales dip, breaking an 11-month streak of monthly sales growth). Honda sales in the U.S. were up 4.3% year over year, while Nissan sales fell 7.2%. Toyota sales inched up 0.1% on a daily selling rate basis, but were down 3.5% on a volume basis. According to a report by the Associated Press, total U.S. auto sales were down 2% in the first quarter. In other downward indicators, we recently noted U.S. housing starts fell 8.7% in February compared with January. Both of these could plausibly be chalked up to the winter season; it remains to be seen if these and other inauspicious economic indicators portend a slide into a longer-term economic slide, or if they are merely blips on the radar. As we recently reported, GM announced plans to invest $300 million at its Orion Township, Michigan plant to manufacture a new electric vehicle at the site. The automaker already manufactures the Chevrolet Bolt at the southeast Michigan plant. The announcement came five days after President Donald Trump again dished out criticism of the automaker for its plans to idle several U.S. assembly plants. The U.S. HDG price moved up 2.9% month over month to $922/st as of April 1. U.S. platinum bars fell 2.4% to $848/ounce, while U.S. palladium bars fell 8.0% to $1,401/ounce. Chinese primary lead fell 3.5% to $2,225/mt. LME copper fell marginally to $6,492/mt. U.S. shredded scrap steel held flat at $332/st, while Korean 5052 aluminum coil fell to $3.29/kilogram.